Hi everyone! I'm back in the land of the living and back in my stamp room creating again! It feels like so long since I've had a chance to just sit down and putz with whatever I felt like doing! I'm happy to say I've finally unpacked all of the gear that I packed for the Duluth Crop for the Cure, and am settling in for a....*GASP* weekend at home! I do have photos of the crop to share with everyone but have not uploaded them yet! I will get to them, I PROMISE! So tonite, I'll leave you with a couple of cards I just sat down and putzed with tonite. I had a bunch of images from Anna Wight's Whippersnapper "Harvest Blessings" stamp set, and got to sit and color them in! 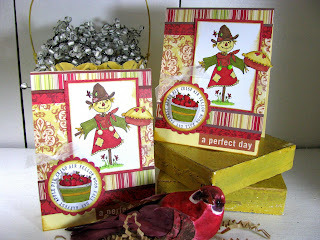 I paired Anna's little scarecrow up with some new Scenic Route Sonoma Scrap Strip 2 that I bought at Archivers last week. I love the beautiful yellows, reds and greens in this paper! The cute little saying "A perfect day" is part of the patterned paper, so I cut out the sentiment for the bottom of my card. While I was sitting there thinking "fall", I decided to use my JustRite 1 5/8" Harmony Circle stamper, and stamp fall words in a circle like Apple Pie, Crisp Air, Yellow Moon, etc...anything I could think of that felt FALL to me. The scarecrow has little yellow brads holding her cute little red jumper together. These are very cute, I love the colors. So skilful, Do you made youesly. So creative. I love the colors and detail here. Your work is fabulous, Lisa! Beautiful cards, Lisa! They're so warm and cheery. Those papers are just gorgeous! Very Cute. I really like them! Hi! I'm Lisa Zappa! Welcome to my blog! I'm on the design team for Crafty Secrets & am a full-time corporate travel agent. 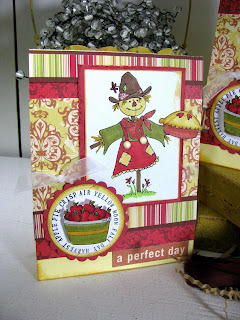 I'm a former Archivers instructor, Stampin Up demonstrator, and previously designed for Hanna Stamps. I'm addicted to junking & shabby treasures! Check out.. ..these Stamping sites! Check out.. ..these Card Making sites! It's a mess, but I get inspired here.